Barbara Filippelli began riding horses at age ten and has been involved with horses ever since. Today, she and her husband own and operate Valley Pond Farms, a professional thirty-eight stall training and boarding facility on an exquisite fifty-eight acres in Westchester County. 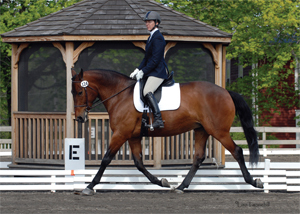 Barbara has had an extensive and successful career as a competitive rider, has been training for over thirty-three years, and is a USEF “Registered” judge in hunter/jumper/equitation in seven states. SC: When did you begin working with Louie? Then one day, he walks into my barn and absolutely looked straight through me. The game was over. We talked and I agreed to have him work on one of my horses and it’s been gangbusters ever since. SC: What happened with your first horse that completely turned you around? BF: The first horse Louie worked on was Meg. Her soundness, her attitude, everything completely changed. She was healthier instantly and just so happy, calm and willing. I could do so much more with her doing so much less, and that’s the whole cake. Her training program completely changed. People usually call him with complaints like “I don’t know what’s wrong with my horse, he’s a little weird. The veterinarians can’t find what’s wrong with him.” Those are the types of problems where western medicine fails, because no one is trained to look for cause. No one asks “why?” That’s where Louie comes in: If the horse is experiencing hock pain, it didn’t start there. That problem is a manifestation of other problems and that’s where Louie is right on when he’s telling you what’s going on with your horse. The real challenges begin after the horse heals because you then have to also change the way you think and train, or else all Louie is doing is patching up what you wrecked. The whole trick is to extend what he teaches you about your horse so that you can continue getting the horse healthier and healthier. We have to be willing to admit we don’t know everything and can do a better job, even when we know a lot, to begin to gain more knowledge from someone like Louie. SC: What else have you come to understand by working with him? BF: The first word that comes out of me is truth. We have to become truthful about who we really are and what we really want. I started realizing truths about myself that I was a little unwilling to admit at first and after that, things really started changing for me and began to reflect back in the horse world. Instead of trying to bend a horse into a job that maybe he or she does not want to do, I would have to be truthful and put that horse into a job it was better meant for. Horse people tend to build up certain images about a horse and what it’s going to do for them. But when you develop a truthful relationship with a horse, then you’ve got be sensitive to what the horse is about also.